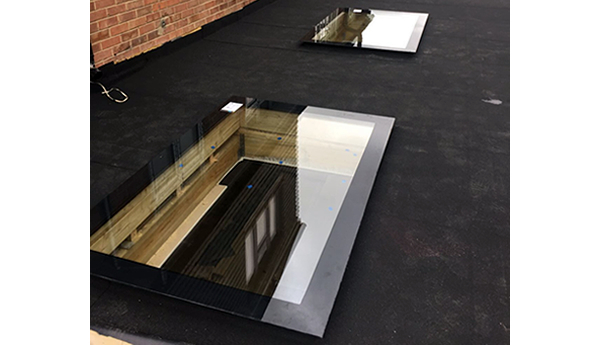 Our bespoke Skylights come with a standard 5 year warranty and are perfect for visually expanding areas such as hallways, stairwells, and other closed-in dark spaces that can be transformed with daylight and sky views. The seamless design with no joints ensures protection from water accumulation and mould build up. TGS Skylights let in twice as much light as vertical windows and will make a great impact on your living environment. High quality materials are used in manufacturing our skylights to ensure the product is attractive and economical with excellent thermal performance. All our sky lights or roof lights are custom made to customer specifications to meet the desired u value required and to comply with building regulations. Additional images showing various fixed sky light and flat roof light types we supply can be found in the skylights photo gallery section of our website. We want you to get the best price for your purchase. This is why we promise to match the prices of other UK retailers. High quality materials from reputable suppliers such as Pilkington glass are used in manufacturing our skylights to ensure the product is attractive and economical with excellent thermal performance. Our standard units are doubleglazed with 6mm toughened glass top pane manufactured to BS EN 12150, 18mm argon-fill cavity structurally sealed with black spacer and 4mm Low-E K-glass to achieve a 1.2 u-value. Our triple and quad glazed options provide even higher performance ratings. 1.6 minimum U-value rating is currently required to comply with building regulations. The solar control layers prevents heat escaping and reflects interior heat back into the room. Coloured boarders – If required we can paint any RAL colour to the boarder which is usually 100mm wide all around. 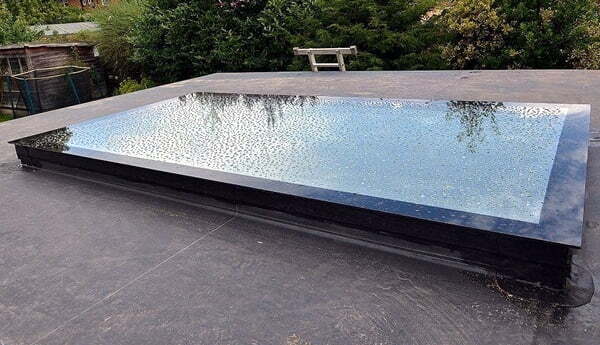 Pilkington Activ self cleaning glass – Applied coating breaks down dirt and washes away with rain water. Pilkington Activ blue self cleaning glass – In addition to self cleaning properties the blue tint provided additional solar control performance by keeping internal temperatures cool whilst maintain light transmission. Triple glazed skylights – achieving 0.8 U Value ratings. 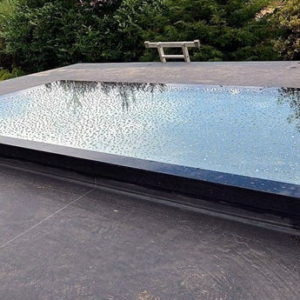 Privacy glass – We can apply a sandblasted frosted layer to make the skylight obscure. Standard manufacturing lead time for custom made flat roof skylights is 7–10 working days depending on the specification. We provide a delivery date within 2 days of processing the sale. In the London and surrounding area we usually deliver for free on the same day manufacturing completes. National delivery lead times will vary. You would need to ensure labour is made available on site to off load the glass from the van. Alternatively we can offer pallet delivery at an additional cost. Our skylight installation can easily be undertaken by builders/roofers and we provide simple step by step fitting instructions and technical support to facilitate installation. This is because, unlike most of our competitors, we use structural glazing silicone to bond and seal the various panes of glass together which means there is no need for an additional timber kerb and our skylight can be installed directly on the Upstand made by the builder or roofer supported by timber battens all around. In addition to self cleaning properties the blue tint provides additional solar control performance by keeping internal temperatures cool whilst maintaining light transmission. 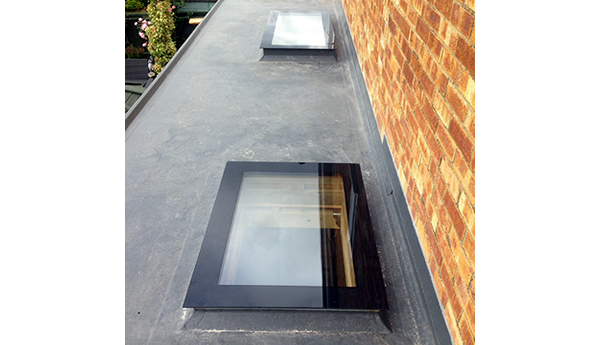 Our skylight installation can easily be undertaken by builders and roofers. We provide simple step by step fitting instructions. For technical support please contact 0203 633 3224. The first step in purchasing your skylight would be to measure the structural opening where the fixed flat roof skylight will be installed. You should allow for 5mm tolerances all around to allow the bottom pane of the skylight to fit smoothly into the opening. As an example if your tight opening measurements are 1010mm by 1010mm we would recommended you purchase a skylight with a bottom pane of 1000mm by 1000mm so it slots in smoothly. For standard skylights the top pane would have a black 100mm overhang all around on the top pane. This would make the overall size of the top pane 1200mm by 1200mm in this example. We can increase the size of the overhang if required. The diagram below shows the sectional view of a double glazed installed skylight. As we use structural glazing silicone to bond the double/triple glazed sealed units to the top pane, there is no need for an additional kerb for our product. The skylight would simply be secured onto the timber kerb built by your roofer/builder as part of the roof construction. The timber upstand should protrude 150mm above the roof. The pitch should be 7-12 degrees, sufficient to allow water to flow down. The final step to finish the roof before installing the skylight is to apply your roof covering up to the to the top of the Upstand to make it weatherproof as illustrated below. The timber upstand should protrude 150mm above the roof and the pitch should be 7-12 degrees, sufficient to allow water to flow down. Bottom pane should be supported by timber battens on 4 sides once set in place, this can be covered with the plasterboard to align with the wall or protrude from the wall. Apply sufficient glazing silicone to the top of the Upstand flat surfaces and firmly position the skylight onto the Upstand. Pressure should then be applied all around the 100mm overhang to ensure the silicone spreads and seals any gaps. Excess silicone should then be wiped away. At this stage the bottom pane should be supported with timber battens on 4 sides and can be made flush with the wall using plasterboard resulting in a finish similar to the picture below. The actual cost will depend on the size and specification of the product. Fill in the form below and we will be able to give you an exact quote for your project. The more information you can give us the better, but do not worry if you do not have all the information to hand. Always helpful, they know their business inside out. We had a fantastic set of glass doors designed by Clive which we love and look at everyday. I recently used Toughened Glass Systems for a skylight in an extension. I was very pleased with the quality of the work and would happily recommend them.